There are many fans of bollywood king Shahrukh Khan but Anubhuti was something more than a fan for him. She once travelled all the way from Himachal Pradesh to mannat to meet him. She was one of the fan for whom SRK was everything. Her profile picture to her cover photo, she didn’t left a single chance to love her superstar. Last year Shah Rukh’s movie FAN arrived in cinema halls with a decent message for the fans. King Khan was widely applauded for his mind blowing acting in different scenes. 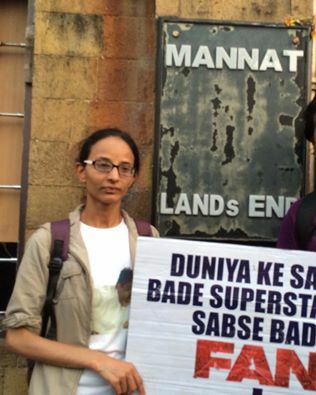 Although her dream to meet SRK left incomplete but she was yet able to get clicked outside Mannat. Although she was not enough lucky to meet or has a conversation with the superstar during her lifetime. But she had sent chocolates to Shah Rukh Khan once at his Mannat residence. Vishal Kharat, another SRK fan uploaded his conversation’s screenshot. Her alternative name on Facebook can be read as ‘Devoted to Shah Rukh Khan’ while her username is ‘myluvSRK’. The thing which matters the most is getting a tribute by SRK after his last chatting session on twitter. I wish i get a chance to meet my superstar srk before i die.I want him to recognise me when i am alive.